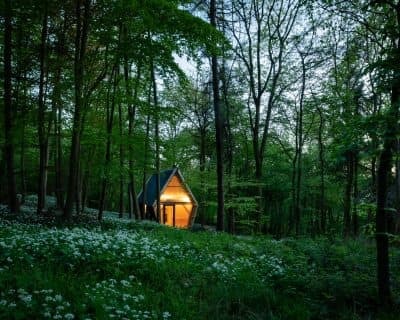 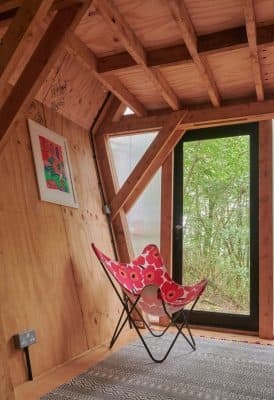 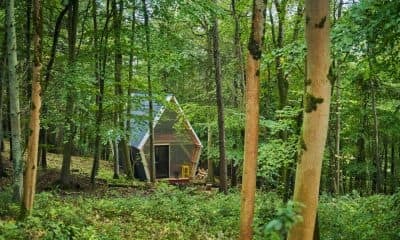 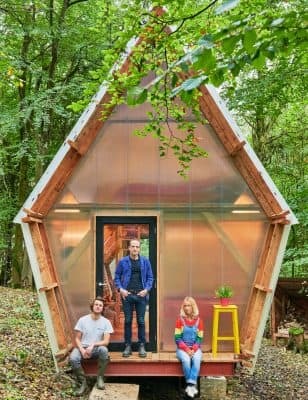 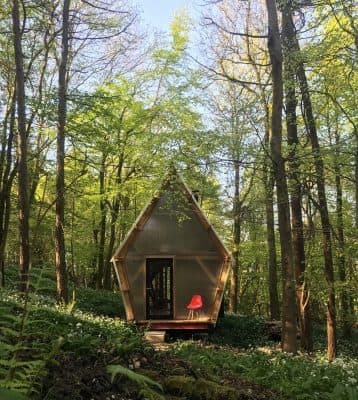 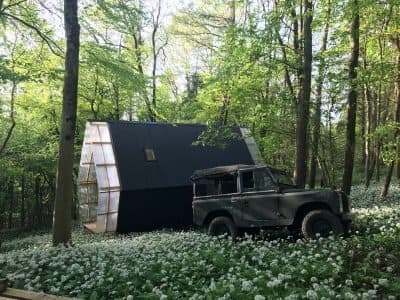 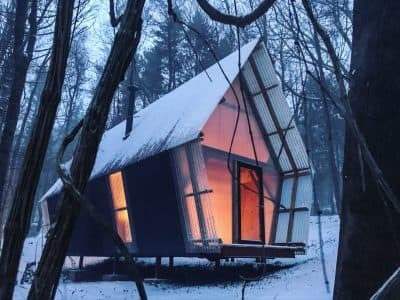 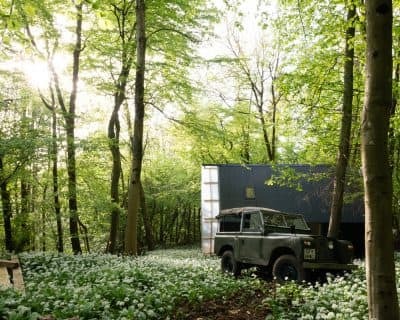 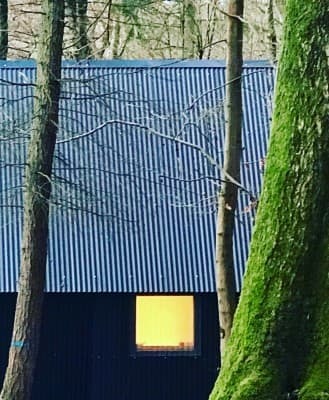 A self built prototype relocatable £20K house, constructed from materials sourced from construction waste and locally grown unseasoned timber. 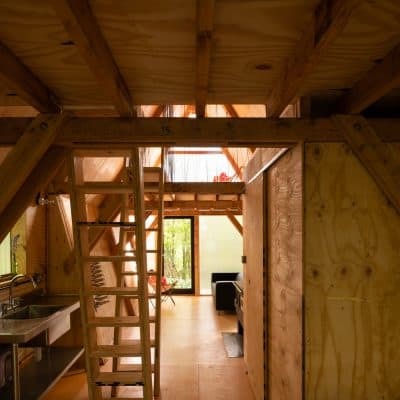 This building is designed to be able to be legally transported on a public highway and used as permanent or temporary accommodation. 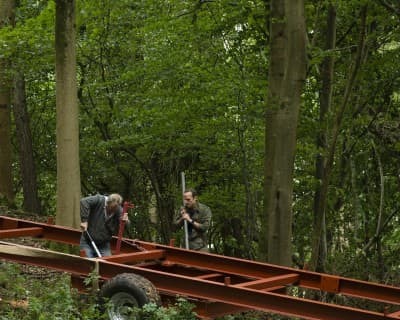 It has a removable wheeled ‘bogey’ that slides out from under the steel chassis when not being moved. 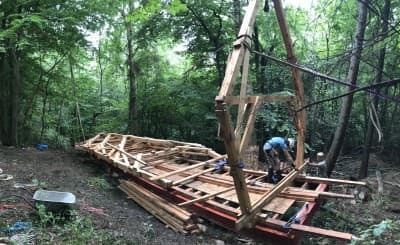 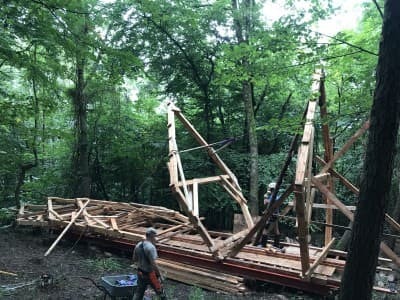 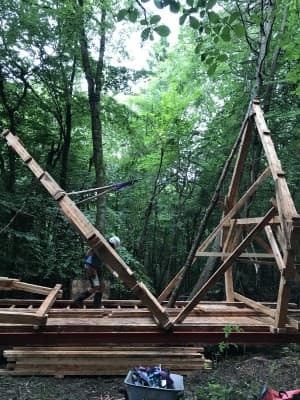 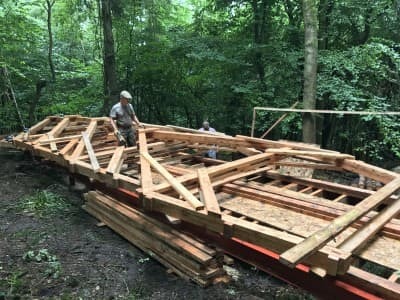 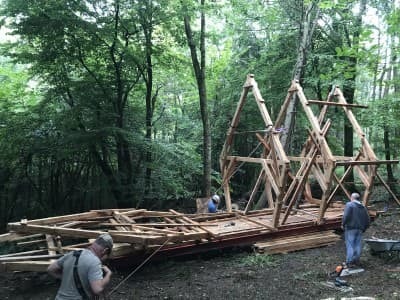 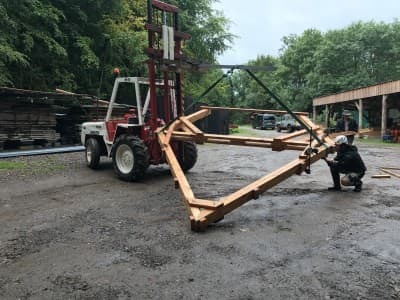 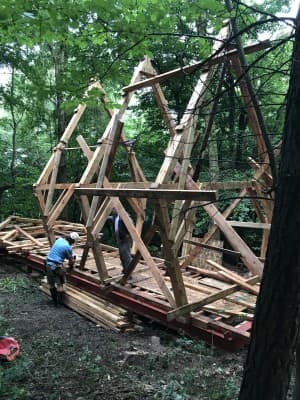 The trailer was driven to site, the bogey removed, and then the bogey used to transport all of the timber frames (which were prefabricated in a workshop) to site. 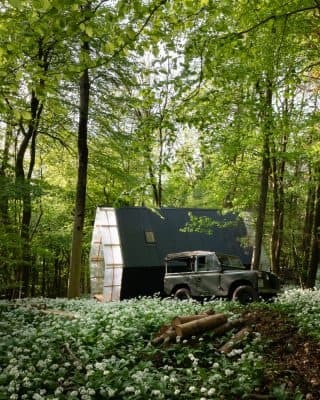 Externally, the trailer is clad in corrugated fibreglass and steel, and internally lined in used but cleaned shuttering ply. 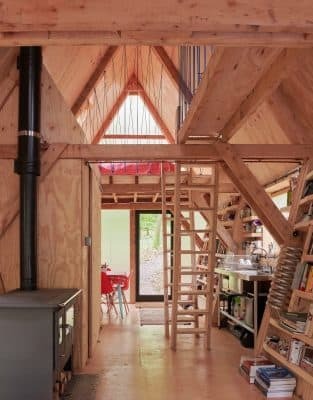 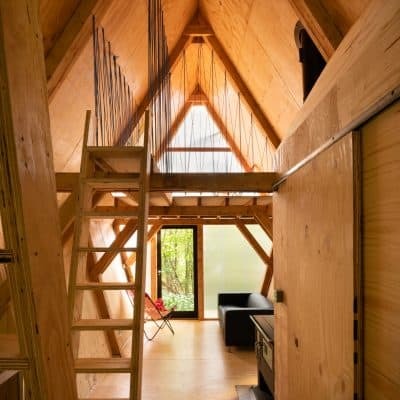 All of the joinery is from plywood offcuts, including the 2 staircases. 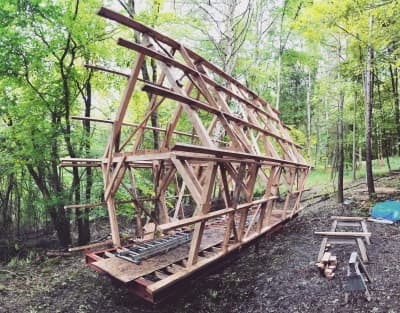 Handrails are made from offcuts of blue rope, left over from Studio in the Woods. 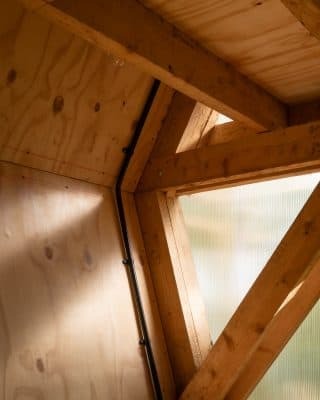 High levels of natural light are provided by both gable ends which are ‘glazed’ with high performance interlocking polycarbonate. 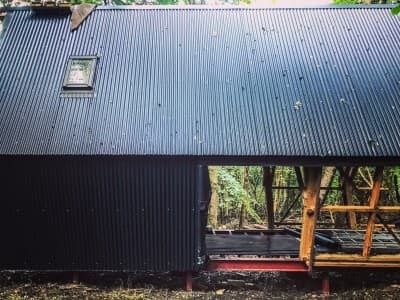 The building is insulated with scavenged insulation, the doors were sourced from a skip, and the roof lights were ‘damaged’ and thus trade ‘seconds’. 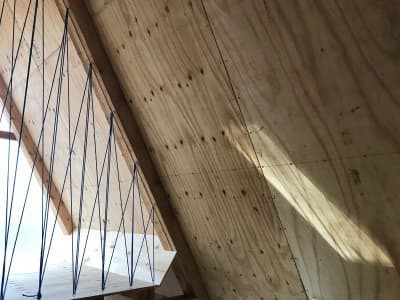 The timber used is all ‘same section’ 125 x 50mm that made the milling much more economical, and is laminated up into structural sections for the cross frames as required. 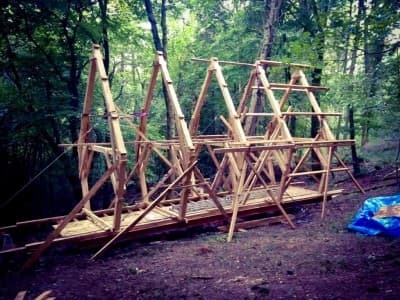 It is the first ‘same section’ building we have completed (the first being Ghost Barn (Equivalent #1). 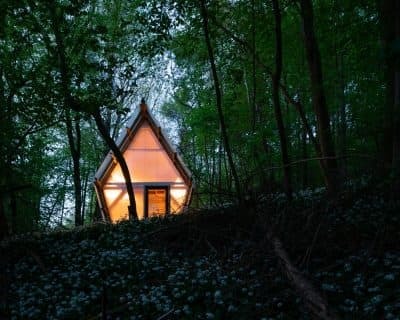 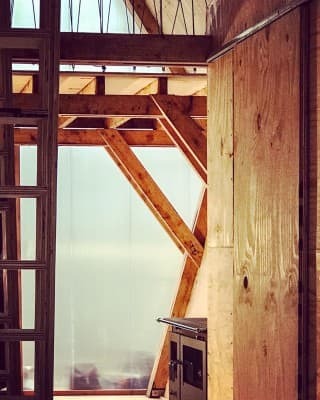 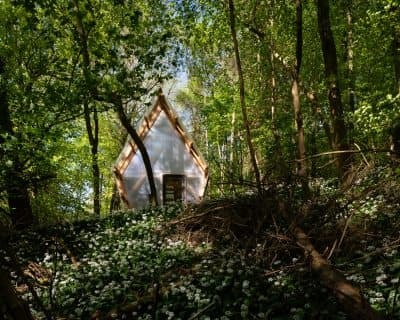 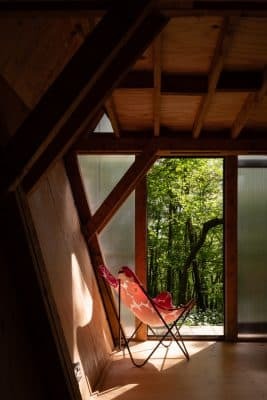 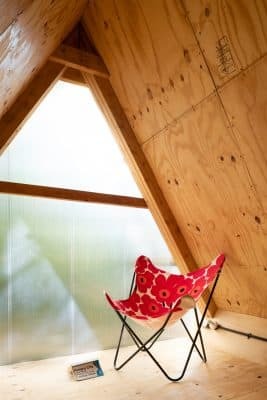 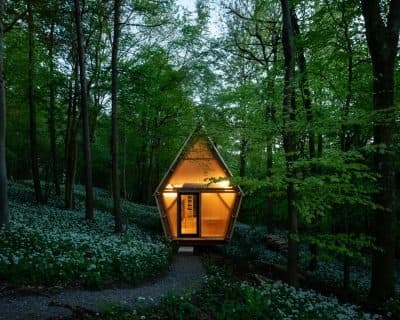 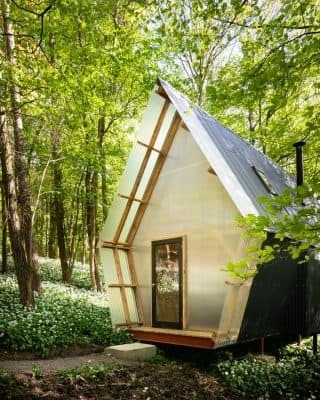 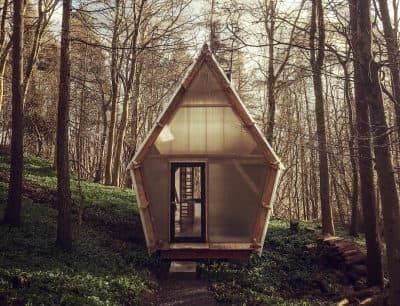 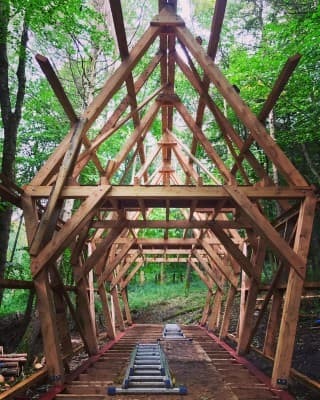 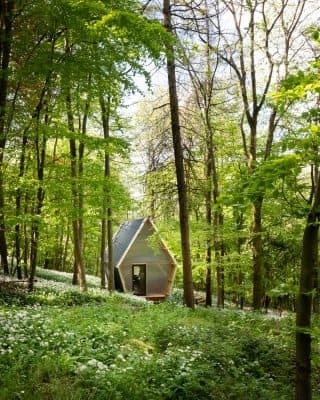 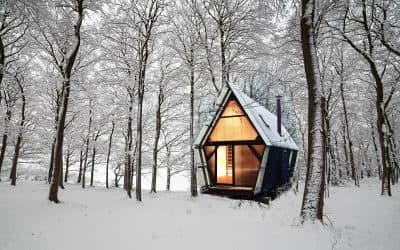 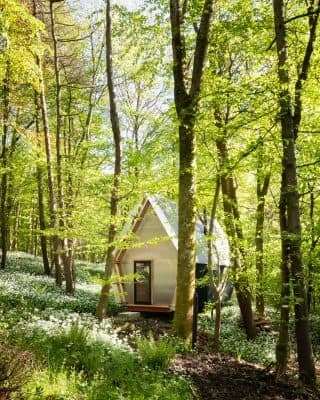 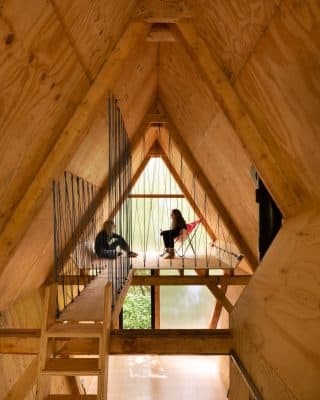 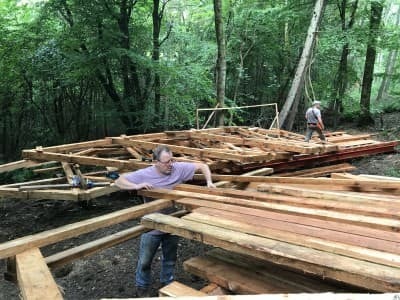 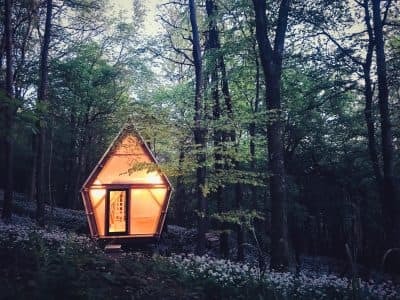 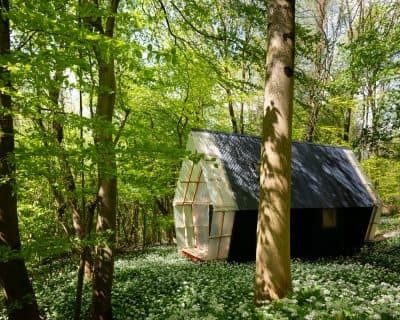 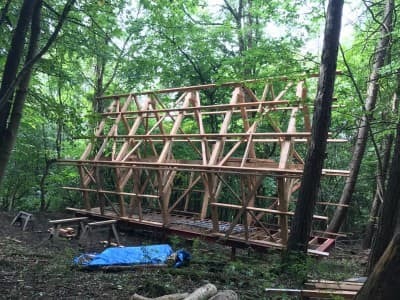 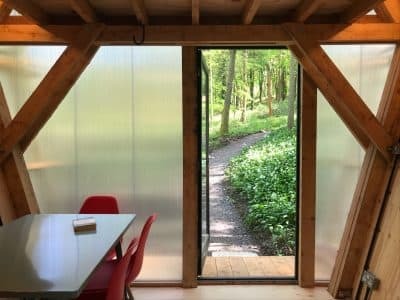 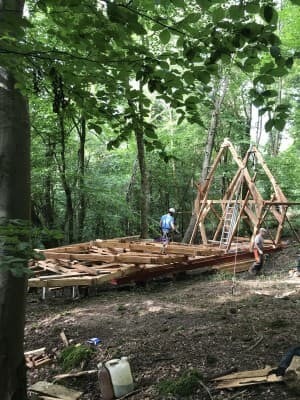 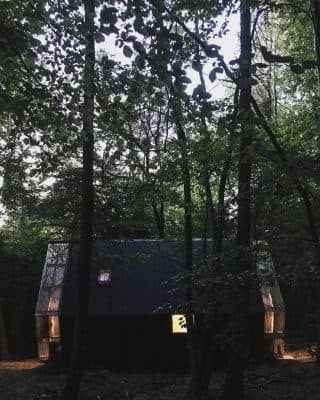 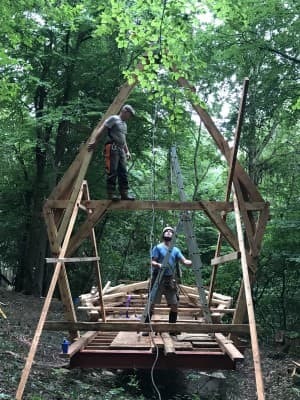 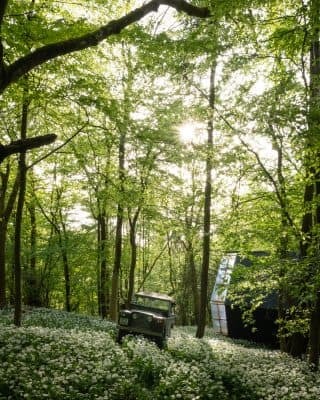 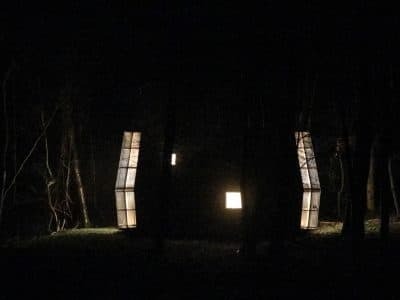 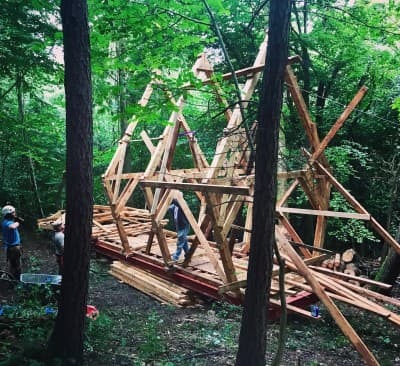 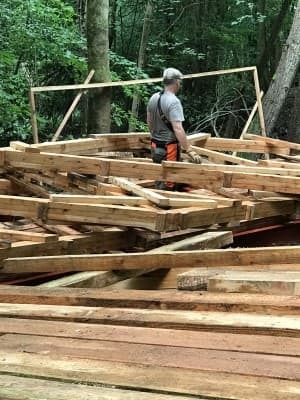 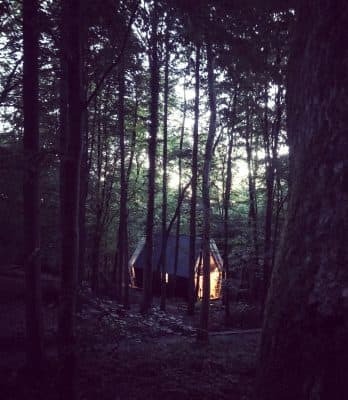 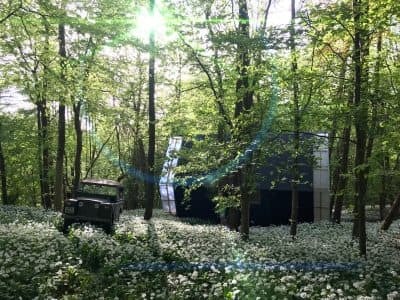 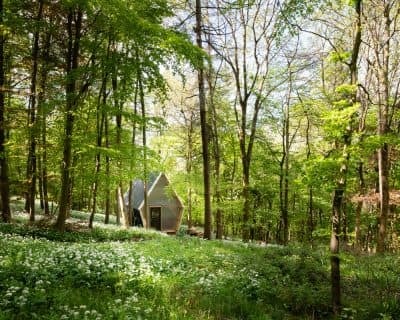 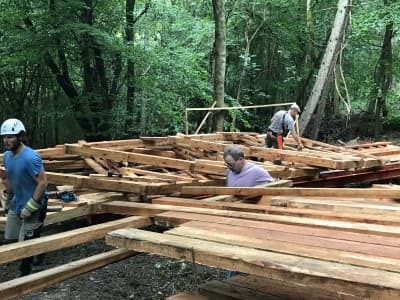 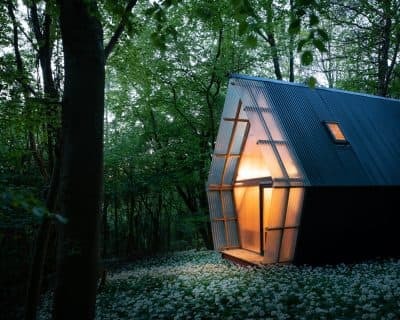 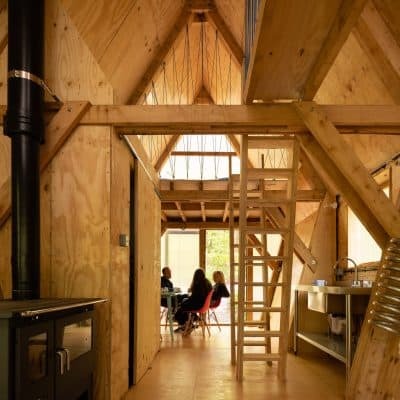 This method of using timber also ties in with the forest management plan for the effective use of timber in the woodland that Invisible Studio manage as a resource around their studio, and from which our own Studio (Visible Studio) was also built. 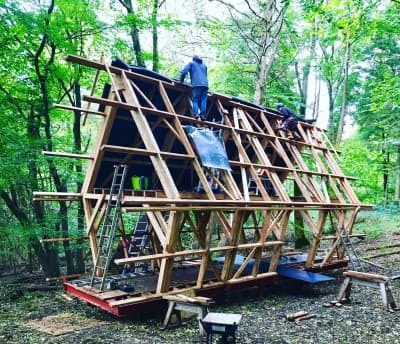 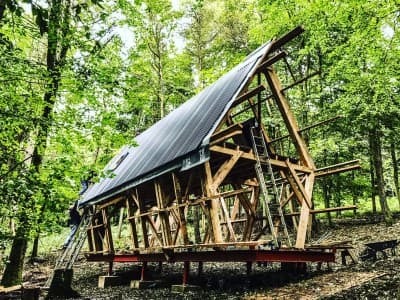 The project aims to provide a super low cost, versatile, useable space that could act as a kit of parts for any self builder to improvise around or easily adapt. 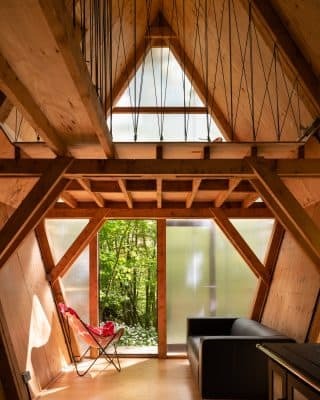 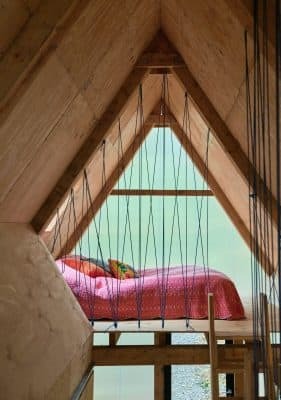 While conceived as a domestic space, it could easily function as a workspace or something else.